With new plant varieties hitting the market each year, someone has to make sure everyone plays by the rules. The people behind Plant Watch want the name alone to strike fear into anyone illegally propagating plants that are under patent protection. Plant Watch began in 2005 as the U.S. arm of the Canadian Ornamental Plant Foundation (COPF), a nonprofit group that deals with royalty administration and monitoring for illegally propagated plants by growers who skip out on paying the required royalties for growing protected plant varieties. COPF started as “a gentleman’s agreement to grow plants and remit royalties to each other,” says Sylvia Mosterman, the executive director of Plant Watch and COPF. However, “people aren’t as gentlemanly as they used to be,” so COPF grew in response to monitor patented and trademarked plants from illegal propagation. Plant patents, or plant breeders’ rights, as they are referred to outside the United States, are granted to “an inventor who has invented or discovered and asexually reproduced a distinct and new variety of plant,” according to the U.S. Patent and Trademark Office (USPTO) website. Patenting a new variety of plant protects only against the unauthorized reproduction of a plant; as an extra layer of protection, a plant can be given a trademarked name, such as Hydrangea macrophylla Endless Summer, for easy identification by consumers. Breeders are the originators of these new plant varieties, and there are companies such as Bailey Nurseries or Monrovia that actively search for new plants from a variety of breeders to add to their corporate brand offerings. These companies usually have brand compliance rules in addition to patents and trademark names, such as the familiar olive-green pots and tags that easily identify a plant as a Monrovia product. Under the names of these companies that consumers have come to know well, these new plants are marketed on a nationwide scale that individual breeders may not be able to achieve. It’s a competitive business, and a large company can easily hold hundreds of patented plant varieties in its portfolio, says Natalia Hamill, the brand and business development manager at Bailey Nurseries, in St. Paul, Minnesota. Tracking down people who are growing patented plants without permission may seem daunting, especially given the many growers, such as nurseries and greenhouses, nationwide that pay royalties to companies for the rights to grow their patented plants for sale to consumers. Long before you find that perfect hydrangea at a hardware store, it must first be researched and put through trials by a breeder hoping to discover new plants. “A lot of what’s done is classic breeding,” such as cross-pollination, Mosterman says, “which takes time and selecting…or innovative classic breeding, which includes things such as embryo transfer—basically ensuring the cross you made actually survives.” Some breeders are looking for ornamental qualities, such as new color varieties or plant heights; others look for more practical qualities such as disease resistance or cold hardiness. If and when that golden plant is found—and sometimes breeders can go a lifetime without finding the one, Mosterman notes—it must go through several growing seasons of trials before it is marketed to growers and then feverishly multiplied by the licensed growers who are willing to pay the royalties to grow the new product for release. 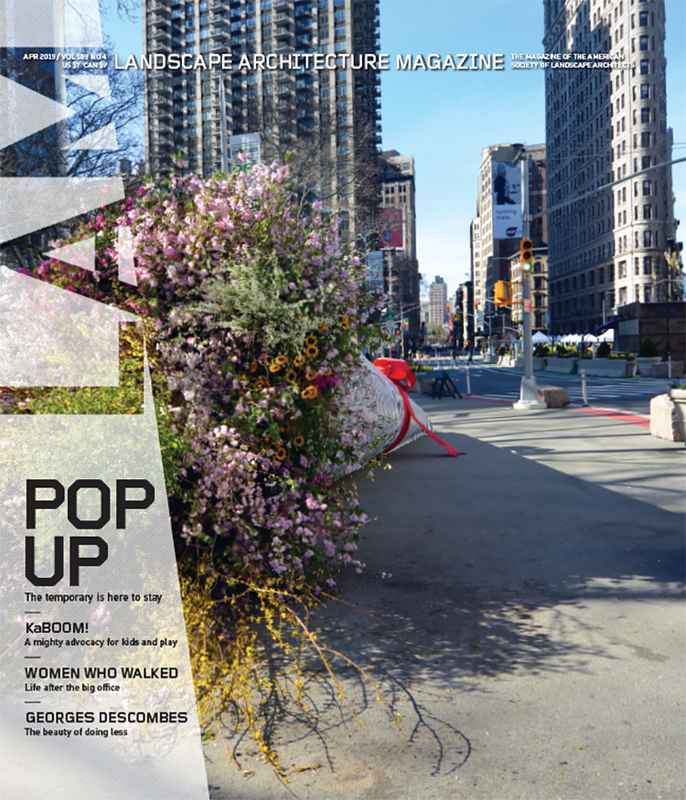 From breeder to store, the process can take on average 10 years, says Jeremy Deppe, the general manager at Spring Meadow Nursery, a provider of woody plants that oversees the Color Choice Flowering Shrubs collection for the popular Proven Winners retail line. Throughout the long trial process for new plant varieties, a breeder may not see a dime until the plants are considered market ready, sales are made, and royalties from licensed growers start coming through. Royalties can range anywhere from a thousandth of a cent by weight of seeds produced, such as violets may be, to a few dollars plus a percentage of the crop per year based on tonnage, in the case of fruit-bearing trees, Mosterman says. As Jonathan Pedersen, the vice president of business development at Monrovia, explains, these new plant varieties are the livelihoods of the breeders and enable them to continue the work of developing new plant varieties. Plant patents in the United States last for 20 years, after which a plant becomes public domain. Deppe says that Proven Winners accounts for 80 percent of Spring Meadow Nursery’s business; the remaining 20 percent “are other unpatented varieties that have been in the trade for some time.” But the trademark name on a plant can continue to be renewed, helping protect the variety after the expiration of its patent. A lot of marketing goes into introducing a new plant, and through this marketing, companies in possession of the plant patent hope the trademark name becomes synonymous with the plant, Pedersen says. So although you’ll be able to propagate Hydrangea macrophylla Endless Summer after its patent expires, it would have to be sold as Hydrangea macrophylla ‘Bailmer,’ its relatively unknown cultivar name. One of the biggest policers of plant patent infringers are the licensed growers, who see their product outpriced on the market and send in an anonymous tip, which can lead to an investigation. Traveling sales representatives for the companies that hold plant patents may catch infringements as well, such as when the product is planted in the wrong pot or when the quality is not up to the company’s standards. It may even be a quick trip to the local hardware store to see if the plants sold there are compliant with the standards outlined in the grower’s agreement. If not, then the company works backward to see where it came from. Once the infringer is found, a cease-and-desist letter is normally issued. If they do not stop even after the letter, legal action may be pursued, followed by the levying of fines and the destruction of the illegally propagated crop. Some companies, like Monrovia, take on the responsibility of finding these illegal propagators themselves. 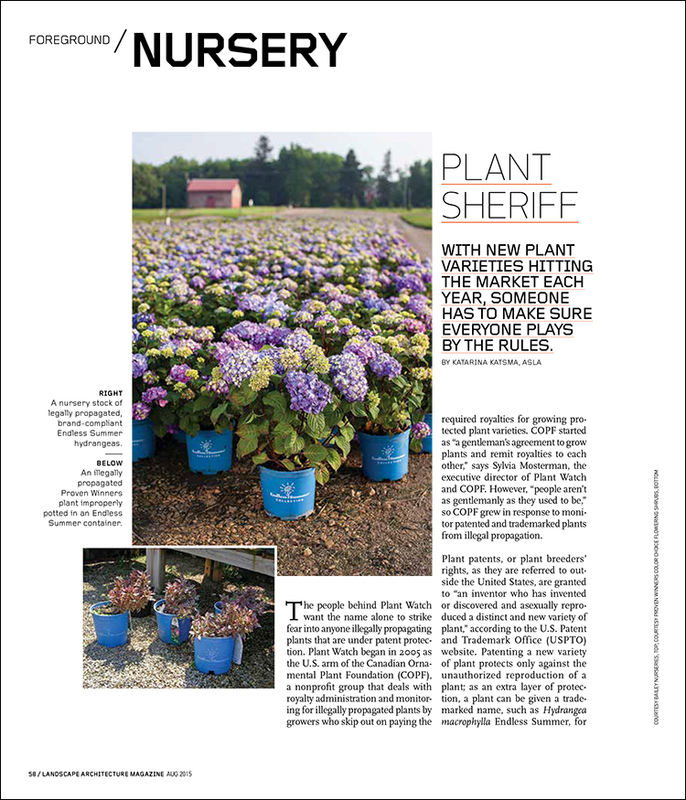 Others work through companies specifically set up for the task: Plant Watch is one such company, and since its American debut, it has brought patented varieties from big-name clients under its wing, such as Bailey Nurseries, Spring Meadow Nursery, Conard-Pyle, and Plant Development Services. Although it’s hard to tell how rampant an issue plant patent infringement is—Mosterman jokes that you can hardly call up illegal propagators and ask them if they’re up to no good—Hamill believes there has been a marked drop in infractions. “I think when [Plant Watch] first started, they found more infractions than they’re finding now, because word has gotten out,” she says. And with the harsh punishments for illegally growing patented plants, some growers think twice when they know someone is out there watching. Thanks for the article. It is especially relevant with combined concerns of conservation, drought and climate change on the scientific end, and gives solid aesthetic perspective. I’m reminded of Texas architect H Dan Heyn, who promoted xeriscaping on projects, yielding amazing results in a related context.